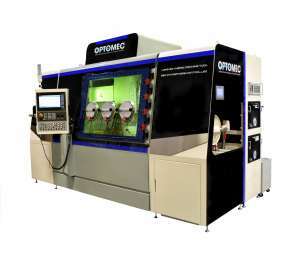 Optomec announced a new line of hybrid metal 3D printers, the large format Machine Tool Series of LENS systems. LENS is Optomec’s metal 3D printing process, which is a bit different from the more common powder bed-laser approach. Instead of a power bed, the LENS system involves jetting a stream of fine metal powder out a small nozzle, whereupon it immediately encounters a powerful laser that creates a meltpool. The system then moves the apparatus in five axes of motion to gradually build up the 3D metal object. They’ve been successfully marketing systems with the LENS concept for many years. Those systems have been relatively expensive, but now the company is opening up the possibility for others to take part by announcing a new series of machines that sport lower prices. The new series is based on a 860 x 600 x 610mm build chamber, which they call a “work envelope”, and there is a good reason for them doing so. That reason is simply that the 860 series is a hybrid machine: it contains not only a LENS system capable of depositing 3D metal, but also a proper CNC milling unit. This means that the system can first deposit a rough metal shape with LENS, then it can mill off excess material to form precision objects. You get the best of both worlds, and can do so efficiently, as you do not have to remount the print in a second machine: the 860 series simply continues within the same work envelope. You build and mill! There’s another very important feature on the new line of machines. One of the machines is called the LENS 860 Hybrid Controlled Atmosphere (CA) System. The controlled atmosphere means the build environment is air-sealed and can reduce oxygen and humidity levels “below 10ppm”. This enables the use of reactive metals, which otherwise could be quite dangerous: aluminum oxide powder, for example was used as the fuel for the Space Shuttle. By eliminating oxygen, you eliminate explosive possibilities. Thus the new systems can take on a far wider range of metal powders, including, they say, stainless steel and tool steel Inconel. Although they do not include the hybrid technology, they can still be very appropriate metal 3D printers for many situations. However, the unit without the controlled atmosphere will have a more limited range of powdered metal materials. Optomec says the systems pricing starts at USD$250,000, which indeed is inexpensive for this class of machine, particularly considering the rather large build volume. However, “starts at” means that price is for the non-controlled atmosphere, no-CNC-milling option. The other machines will be priced somewhat higher, still at reasonable prices for very capable machines.